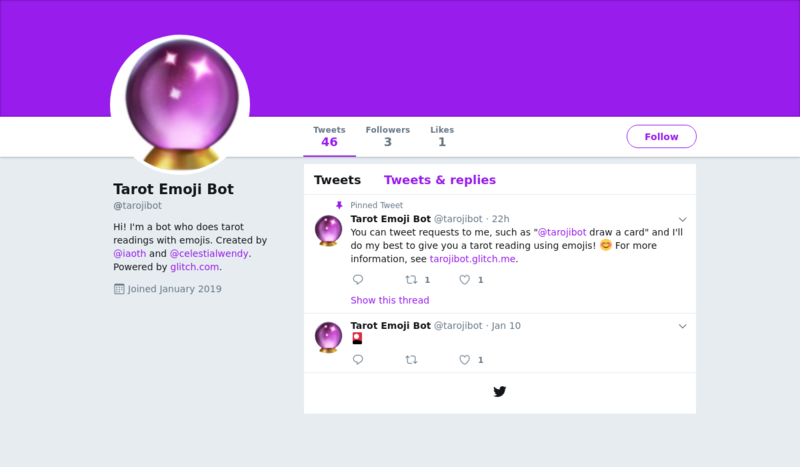 @tarojibot is a Twitter bot created by Joakim Almgren that does tarot readings using emoji. For example, if you tweet “@tarojibot one card, please”, it draws a card and tweets it to you. See tarojibot.glitch.me for a complete set of commands and a glossary of which emoji correspond to which tarot cards. You can tweet requests to me, such as "@tarojibot draw a card" and I'll do my best to give you a tarot reading using emojis! 😊 For more information, see https://t.co/ibIMICR9ZV.